Question: When you look at yourself and your generation of baby boomers, and compare yourself with your grandson who is a few generations apart from you and belongs to generation “A,” you, of course, see a big difference. What is the root cause of such differences? Why do new generations have a completely different perception of the world? Answer: From the moment of the creation of our universe, from the Big Bang to today, all of our development was egoistic. First, evolution was at the level of inanimate matter; atoms began to form and connect to molecules. Then, plants appeared on the surface of the globe, later animals, and finally, man who has also been developing for many tens of thousands of years. All of this evolution was due to the growth of egoism inside the matter at all of its levels: inanimate, vegetative, animal, and human. Thus, the egoism of the generation of my grandson, of course, is a lot greater than the egoism of my generation. He demands more from life. After all, the more time that passes from the beginning of creation, the more matter develops. Its development is expressed in the fact that it begins to demand more fulfillment, both in quantity and in quality. Accordingly, one generation is different from another. In addition, there is a certain acceleration of generations. Before, it was necessary to pass several centuries in order to make the difference between generations noticeable. Nowadays, the generation is completely new every ten years. Egoism grows and requires more and more from life. Therefore, the modern generation needs to know the meaning of life, its essence, and how to fill one’s egoistic desire, which has grown in relation to past generations. It quickly finds out what is worth doing and what is not. In short, it is more selfish. The quality of egoistic desire has also changed. Man can no longer be filled with small joys that were characteristic of the old generation. I remember when they bought me a bicycle; the joy lasted for about two years. My younger grandson is almost indifferent to whether he has a bicycle or not. He is looking for better fulfillments. As a child, I looked at a plane in the sky and was inspired just by its appearance. My little grandson was taken on a trip to France, and I was amazed at how calmly he entered the plane, as if this was the most ordinary event. He treated it like an adult. From the outside, it seems that he is a small child, but in fact, there is an adult inside who is not impressed with the material. His impressions and their form exist on a completely different level. The modern child turns on the computer and knows in advance what should be there. His inner need tells him how each button should work. He knows that the computer was prepared for him by the last generation, and that’s what it should be. This generation comes and opens things, knowing in advance that they have already been created. This is very characteristic of the last generations. After all, our generation only made discoveries and created new things. It was a generation that had nothing. Everything just started to enter our life. Cars and planes—we created them ourselves. For our grandchildren, it has become ordinary. The sky and the earth are full of all kinds of machines. So, nothing impresses the young man: not mountains, the supermarket, nor the amusement park. Everything seems to be obvious in advance. Egoism has become more sophisticated, complex, and requires a better fulfillment. Question: What tools does the wisdom of Kabbalah offer in order to manage egoism? Limiting yourself with the help of the upper Light, which a person receives through the group. Nullifying yourself with regard to the group and to this degree feeling one’s lowest point. Investing all of my efforts in the group and in helping the friends in the group, in order to attain the highest point. The gap between the lowest point and the highest point determines the format of the revelation of the Creator to a person. There has recently been a flood of Russian-speaking religious people on my Facebook page. Answer: Everything that I teach is taken from the writings of Baal HaSulam and Rabash as well as from the Kabbalists of all times. They should study the wisdom of Kabbalah and then make their case with specifically what things they think I am saying of my own. 2. Why do you appeal to non-Jews? Answer: This is because we are in the generation of the Messiah about whom it is said, “And all the nations shall stream to it” (Isaiah 2:2), and “My house shall be called a house of prayer for all peoples” (Isaiah 56:7) and similar things. I am asking you to study the wisdom of Kabbalah and then disagree about things. Or not to say anything initially if it is not your area. Please refrain from pointlessly arguing with my words! Thank you. 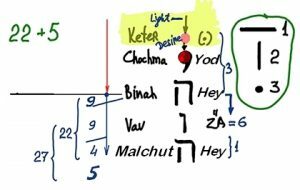 Question: Why do the 22 letters of the Hebrew alphabet begin from the level of Bina? Answer: Bina operates until its middle under the influence of Keter, and from its middle onward it wants to resemble Keter, so it develops everything by itself. It receives the attributes to bestow from Keter and in order to implement them and to resemble Keter, it begins to bestow unto the lower, just like Keter. Because nine Sefirot descend from Keter, the first nine letters develop from Bina, (nine Sefirot the last part of Bina). The next nine Sefirot belong to Zeir Anpin. The last four letters, Kof, Resh, Shin, and Taf belong to Malchut. All together there are 22 letters, 22 forms of bestowal of the upper force unto Malchut. In Malchut there are five additional letters. These are special letters of the 22 letters which create their final forms in Malchut. All together there are 27 letters of the alphabet. Why Are There No Letters Above Bina In The Spiritual World? Torah, Deuteronomy, 28:23: The heaven which is over your head shall be bronze, and the earth which is under you, iron. The heaven and earth symbolize desires within a person. We are talking about such types of restriction when you will be unable to do anything with these desires: neither with bronze nor with iron. The heaven has to be the property of Bina, the property of bestowal and love, but it is not. If you do not connect with others like you in the correct interaction, then all of life becomes very tough. You do not have the Creator or egoistic desire. You exist between them like in the air. Question: My wife is wondering why it is necessary for me to study Kabbalah and not something else? Answer: You are studying Kabbalah because you like it, and you cannot live without this study. You want to discover and know the structure of the upper world and attain the meaning of existence. This is very important for you. Explain this to her. If she loves you, she should understand you. There is nothing higher than studying the wisdom of Kabbalah, and there is no knowledge that is higher. How Does One Study The Wisdom Of Kabbalah?